The first Pilatus PC-24 prototype, P01, made its maiden flight this morning from the company's headquarters at Buochs Airport in Switzerland. 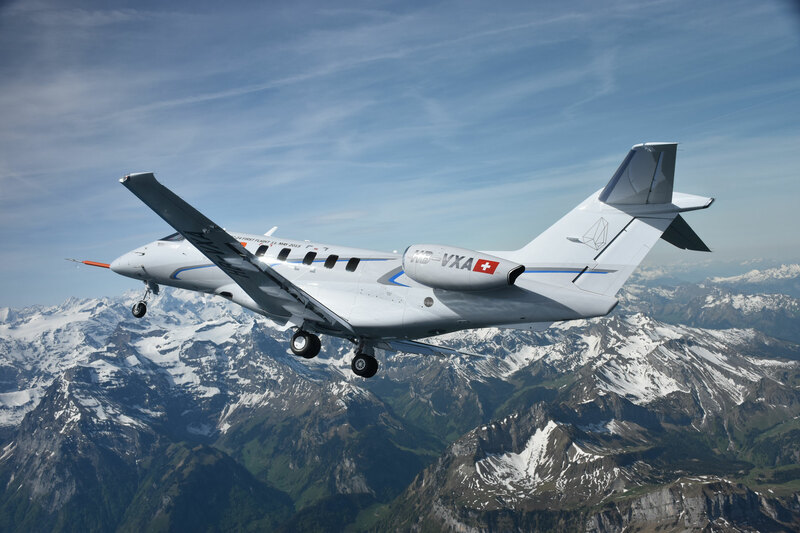 Flown by Pilatus test pilots Paul Mulcahy and Reto Aeschlimann, the twinjet, registered as HB-VXA, took off at 10 a.m. local time and completed what the pilots described as a flawless 55-minute mission. "Everything looks great so far. Beautiful handling—the PC-24 flies just as expected—a real Pilatus aircraft," Aeschlimann radioed during the flight. As is common practice on first flights, the landing gear remained extended and the new jet was accompanied and monitored by a chase airplane (a PC-21). Twelve flight-test engineers on the ground pored over real-time telemetry flight data from the PC-24. Early performance data indicates that the jet had a takeoff roll of less than 2,000 feet (600 meters) and climbed to 10,000 feet in approximately three minutes, after which the two pilots completed a series of planned tests. The maiden flight followed a route across central Switzerland, from Altdorf to Brünig via Engelberg, before returning to Buochs. Three PC-24 prototypes will be used in the test program, which will involve some 2,300 flight hours over the next two years. Certification and first deliveries of the new jet are slated for 2017.